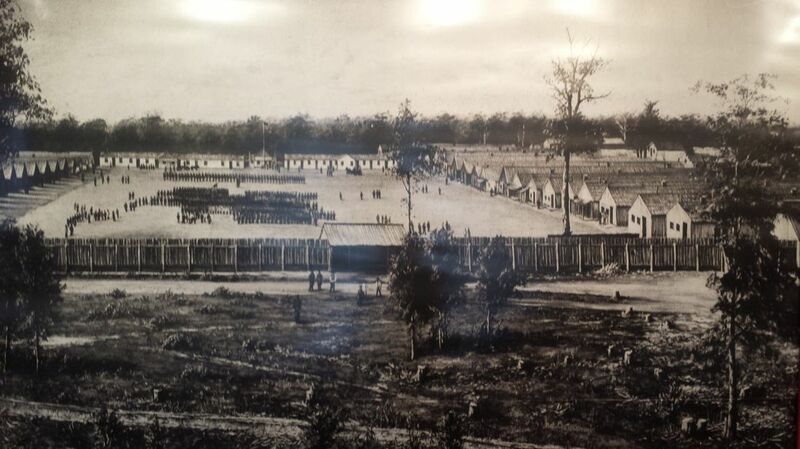 The photograph to the right is Camp Butler in August 1861. The original is in the Abraham Lincoln Presidential Library and Museum. who had been without food or fire for twenty-four hours, stood impatiently in line of battle eager for something to be done that would warm up their chilled limbs and bodies. To continue the retreat, or to fight either would have been a welcome change, but the order that was passed down the lines was received almost in a spirit of mutiny by both officers and men. All knew that Do not fire on the enemy could mean nothing but surrender. Rations were served out, cooking utensils distributed, and fires built; but while busy cooking the men were ordered to fall in, stack arms and march, and breakfast was abandoned or eaten half raw. Upon arriving at Tiptonville the surrendered army was formed in close column, in an open field, and surrounded by guards. The field had been cultivated in corn, the previous year, and though the hollows between the rows might in dry weather, have offered rather tempting couches, they were treacherous ones in a wet season, while the black swamp mud was not conducive to cleanliness. During the day flour and bacon were served out, and the men had plenty of time to cook and eat. With night came on a storm, and the prisoners made such shelters as they could with fence rails and blankets. The only fuel was that offered by fences, with the stumps of the newly cleared land for pieces de resistance. Those who essayed the blanket shelters were roused by trickling streams of water from above, to find themselves lying in ponds of water one or two inches deep. Sounder sleepers would not awake till some rascal had filched their blankets, and the fire-builders had stolen their rails. By midnight the majority of the twenty-five hundred prisoners were packed, in circular groups, six or seven deep, around the fires, which dotted the field, or were wandering disconsolately from fire to fire hoping to find some place where a gleam of the flames could be seen. The anathemas of the men were bestowed quite impartially upon the weather, the Yankees and Gen. Mackall the Confederate Commander. Words and invective were exhausted in showering curses upon the last. Had they not been prisoners the discomforts of the night would have been of little moment, but under the existing circumstances it was dismal beyond description. Day at last dawned, and the men were almost ready to welcome with a cheer the arrival of the transports, which were to take them away from such a mud-hole, even though it was to a military prison. The boats were small stern-wheelers and conveyed the men only to New Madrid, Mo., where they were landed in the mud. New Madrid mud is red, contrasting well with the Tiptonville black, and, as there was no opportunity for ablutions, mud and smoke soon rendered the Confederates as varied in hue as Indian braves. Abundant rations of hard tack, bacon and coffee were served out, and, although the storm had not ended, the situation was much more comfortable than during the preceding twenty-four hours. The officers were now separated from the enlisted men something akin in pain to parting parents from children. convoy, the boats steamed up the river. At dusk the fleet passed Island 10, stopping for a short time; the next morning Columbus was left behind, and by 10.30 a. m. a landing was made at Cairo. The prisoners were here transferred to close box-cars, which to sight and smell, bore evidence of having, very recently, been used to transport cattle. A bale of hay was rolled into each car, to serve when spread over the floor as seats and bedding. To secure the safety and welfare of the passengers one guard was placed in each car, and was not relieved till the train reached its destination. The sentinel in our car was an Irishman, a social, friendly fellow, considerate of the prisoners feelings and reposing great confidence in their honor, which confidence was not abused. Probably his superiors would have been some what astonished at his ideas about guard duty, which were not those laid down in army regulations. Whenever the train stopped, even after nightfall, he would either allow some of the prisoners to jump out and fill their canteens, or go himself. During the night he handed his musket to one of the Confederates, laid down in the hay and went to sleep. His brother, the guard in the next car got uproariously drunk, and about midnight came stumbling into our car. He was so quarrelsome that we put him out, in a few minutes he was back, this time bringing his musket and threatening vengeance, but our slumbering guardian being aroused quieted him with a few words, more forcible than elegant, and sent him back to his post. Placed under a quasi parole of honor by the kindness of our Irish friend, not a prisoner attempted to escape from his car though there was abundant opportunity. In one village through which we passed in the night citizens dress was offered to some of the men to enable them to escape if they so desired. The train reached Camp Butler, four miles from Springfield, Ill., Saturday afternoon, April 12th. In the surrounding fields patches of snow were still visible, but the camp itself was a mud-puddle. When we left Alabama, a month previous, the fruit trees were in blossom, planters were busy ploughing, and the air was mild and balmy; on our arrival at Island 10 it was cold and the trees were bare, the first signs of Spring appearing as we left; now, for the third time, we were to have wintry weather. There were at Camp Butler fifteen or eighteen hundred prisoners taken at Fort Donelson, these occupied eighteen out of the twenty barracks within the prison lines, two being used as hospitals. The new arrivals were ordered from the cars and marched to the parade ground for inspection; blankets were unrolled, knapsacks unstrapped and the persons of the prisoners searched for concealed weapons, but no money or valuables were taken. Some three hundred of the prisoners were then sent to the barracks, and to the remaining six or seven hundred were allotted tents, one to every six or eight men, boards were distributed for floors and before night the men were comfortably sheltered. The barracks were about sixty feet long by twenty wide, standing twenty feet apart, and were intended to accommodate one hundred men each. In front of the barracks a street fifty feet wide intervening the tents were pitched. Immediately to the rear of the line of tents was the guard and dead line; the dead line at the ends was within a few feet of the lines of barracks and tents and about two hundred feet to the rear of the barracks, thus enclosing in round numbers a parallelogram 800 feet long by 300 or 350 feet wide. As the warm weather came on, a second line of tents was pitched in the rear of the first and the crowded barracks relieved. was esteemed a great privilege to go with the wagons as it gave opportunity to bathe and to gather mussels in the river. The fresh country air too was a wonderful contrast to the stifled atmosphere of the prison camp on a hot day. Outside the guard lines was another prison hospital. set apart for erysipelas cases, of which there were many among the prisoners. Its occupants burned in stripes with lunar caustic and painted with iodine, were a horribly grotesque crowd. Side by side with this hospital was the dead house, always tenanted with bodies waiting burial. At the head of the street, which separated the barracks and tents, was the headquarters of the Commandant of the post; at the other end of the street was the guard house with its dreaded black hole, a cell without light or ventilation. In an addition to these buildings were the commissaries, Quartermasters and Sutlers stores, and the barracks for the guard. When the Island No. 10 prisoners arrived the camp was not enclosed, and there had been in consequence many escapes. It was quite common to hear in the morning the announcement, A squad of prisoners left for home last night. 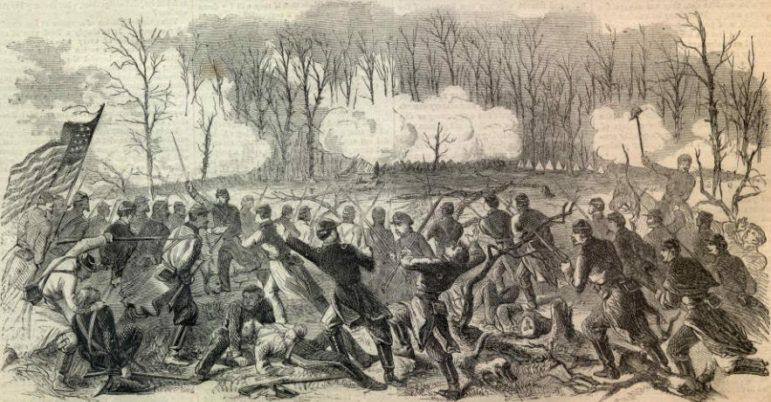 As calling the roll was entrusted to non-commissioned officers among the prisoners there were no commissioned officers prisoners at Camp Butler and as their reports were verified not oftener than once a week, several days were usually allowed to elapse before absentees were reported, thus giving them a fair start in the race for the Ohio or Mississippi Rivers. As many as nine broke through the guard lines in a single night; nor were escapes confined to the darkness, sometimes a break would be made in the broad daylight, and as the cavalry patrolled the lines during the day with sabres, the only risk was that of recapture. In one case, as the astonished sentinel saw prisoner after prisoner flitting by, he cried out, in accents of despair, Corporal of the guard! corporal of the guard! run here quick, all the rebels are getting away! These frequent escapes of prisoners soon led to more rigorous measures. Those recaptured were incarcerated in the black hole for a week or ten days; all prisoners were required to remain in their barracks from dusk until reveille, under penalty of being shot, and a board fence ten feet high was built around the camp. The fence, made chiefly by volunteers from among the prisoners, small wages being paid them, was completed early in May, and served to check the flight of the prisoners, though it did not prove an effectual barrier. Not many nights after its completion, during a storm, a party of four scaled it by aid of a short ladder they had constructed; a flash of lightning revealed them to the guard, who fired, but without effect. Some of the prisoners who worked on the fence, broke short the nails with which certain marked boards were fastened; making a dash for the fence one day they pulled off one of these planks, and three got through before the sentinel could fire. Two of the three were recaptured while running the gauntlet of a militia camp, just outside the enclosure and did penance in the black hole, the third escaped. An attempt was made to tunnel out, but it was betrayed to Maj. Fundy, and stopped when the tunnel had nearly reached the fence; it was started from a freshly dug sink. Those engaged in it escaped punishment by pledging their word not to renew the work. The cavalry regiment guarding the camp having been relieved by un-uniformed militia, a novel plan of escape was successfully tried. A lot of rusty muskets had been found in one of the bar racks by the Fort Donelson prisoners on their arrival, these had been carefully concealed with a view that they might sometime be useful. After the wells began to fail, and before the hauling of water in wagons had been begun, squads of prisoners were allowed to go out with guards to neighborhood wells and fill buckets and canteens. Procuring or fixing up costumes sufficiently like those worn by the militia to be mistaken for them, and brightening up the old muskets so as to pass muster, some of the prisoners played the part of guards and escorted out several squads who did not return. Another scheme was successfully played on the militia, who were very ignorant, many being unable to read. Hospital attendants were given passes to cross and recross the guard lines, they giving their paroles not to escape; noting carefully those of the guards who read these passes equally well bottom or right side up, bogus passes were prepared, no attempt being made to imitate the writing of the Federal officials, and the guards passed the holders out. No less than thirty left in this manner before the imposture was detected. None of those under parole violated their pledges, nor were they in any way connected with the writing of the spurious passes, but they suffered, as all passes were revoked. The regulations were henceforth so stringent that but few were able to elude the vigilance of the guards. During the six months that elapsed from the arrival of the prisoners to their departure for exchange, 225 escaped from Camp Butler. Not all of these, however, got back to Dixie, quite a number being recaptured and sent to other prisons. Among those who escaped by bogus passes was John Frank, Jr.; starting for the Mississippi River, he, and one or two companions, lost themselves on the prairies and, after wandering around for several days, made their way to a farm-house, where they procured something to eat, though they were suspected of being rebels. They next, unfortunately, wandered into Alton, where, finding themselves objects of suspicion, they surrendered. Frank rejoined us only when on our way to be exchanged. The first tragedy under the regulation requiring the prisoners to go into the barracks or tents at dusk, occurred on the evening of May 2d. One of the prisoners was seated on the steps of his barrack washing his feet, when retreat sounded; a guard, standing almost beside him, ordered him in, but the man was a little slow in complying, as he had his feet in the water; the guard repeated the order twice, and then fired on the prisoner, inflicting a wound from which he died in about three weeks. The sentinels conduct was approved, and he was promoted to be a corporal, but the precaution was taken not to place him on guard over the prisoners again, for fear of his meeting with an accident. On our arrival at Camp Butler the commander of the post was Col. Morrison, a superannuated officer of the regular army, kind hearted but very irascible. In his conduct towards the prisoners he was generally very lenient; soon after their arrival he had clothing and blankets issued to those who were insufficiently clad, and did them other favors. Towards his own men he, was a martinet. On one occasion the colonel crossed the guard line and the sentinel failed to salute him; crossing a second time to make sure the sentinel saw him, he halted in front of the negligent guard, and in thundering voice demanded: Do you know who I am, sir? Yes, sir, was the quavering response. Why did you not salute me? and without waiting for a reply, he seized the volunteer by the collar and administered to him a sound kicking. To the prisoners, accustomed to a perfect equality between officers and men, this was a novel sight and excited various comments To the commissary officer of the post, a Virginian, and, it was said, a Southern sympathizer, the prisoners were greatly indebted for full rations and the privilege of trading any surplus for luxuries and merchandise at very reasonable rates. He had the reputation of being square in all his dealings, and was consequently much liked. On our arrival, and for sometime after, the mortality at Camp Butler was great; up to the 25th of May there had been 318 deaths, a rate equivalent to 56 out of every 100 per year. During the month of May Maj. Fundy, of the Twelfth Illinois Cavalry, was given supervision of the Camp, and, by stricter sanitary regulations, the death rate was diminished, there being but 162 deaths from May 25th to September 6th, a rate of about 22 out of every 100 per year. If it be taken into consideration that several hundred prisoners had escaped, the percentage of deaths will be somewhat greater than stated. Up to September 6th, the date of exchange, 225 had escaped, leaving 2,613; the average time of imprisonment was nearly twenty-six weeks that is 1800 men 200 days and 1000 men, 146 days; the total number of deaths was I 480, or 18* out of every 100 for the six months, or 36 per 100 a year. In this connection it is but fair to state that the provision made for the sick was ample; a good assortment of medicines was kept in the hospital drugstore, which, after our arrival, was placed in the charge of Joseph Hurd, of Co. K, a competent druggist. Among the prisoners were several surgeons, and in addition to these, Dr. J. Cooper McKee, U. S. A., was surgeon of the post. While he was in charge he ordered large additional supplies of medicine, and a room was fitted up exclusively as a drug store. When he was relieved, the latter part of July, a Springfield physician was placed in charge. The nurses were volunteers from the prisoners, among them N. K. Adams and Wm. H. Fay, of Co. K; D. P. Smith was Mr. Hurds assistant. To resume the company diary: On the Sunday follow ing our arrival it set in to storm, and on Monday there was a heavy fall of snow, a novelty to many who witnessed it. Spring now rapidly advanced, and by May 1st the trees were beginning to leaf, the grass was green and violets were in bloom. On the 23d of April there was seen the curious phenomenon of four mock suns, the real sun being in the centre. There was a brilliant electrical display on May 30th ; for nearly an hour the flashes of lightning were almost incessant, but a few seconds intervening, while at times, for several minutes together, the play of electrical light would be absolutely without intermission. Occasionally great nebulous balls of fire would roll up from the horizon to the zenith, then would follow flashes of chain and forked lightning, diverging to every point of the heavens. No rain accompanied the electrical storm, but during its entire continuance there could be heard the distant low roll of thunder. May 3d the camp was shocked by a tragedy in one of the barracks occupied by Mississippians: one of the prisoners, in a quarrel with a companion, seized a billet of wood and struck a fatal blow. The murderer was taken to Springfield and put in jail, but was not brought to trial, and when the prisoners were exchanged he was sent with the others. May 9th, Thomas G. Roe (private, Co. K) died of measles. This was the first death in our company, and caused sincere sorrow. On the following day he was buried in the prisoners graveyard, near the camp. Col. Morrison kindly permitted the company to accompany the body to the grave. William H. Fay read a chapter in the Bible and made a prayer. The grave was marked with a headboard inscribed with the name, company and regiment of the deceased. Early on the morning of May 14th, A. J. Merritt (sergeant, Co. K) died of measles. Both he and Mr. Roe were sick from the time of our arrival. Mr. Merritt refused to give up, and remained in his tent till within a day or two of his death, when he became so weak as to be forced to go to the hospital. He was much depressed from leaving home and family, but both he and Mr. Roe died very peacefully. On the morning of July 7th, John N. Cook (private, Co. K) died, and was buried the same day, the company receiving permission to attend. This was the last death in Co. K at Camp Butler. 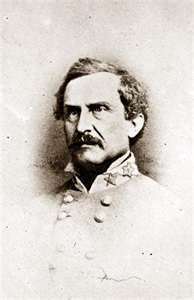 On the 22d of June, Col. Fundy succeeded Col. Morrison as commander of the post. He was much less of a martinet, and was also popular with the prisoners in consequence of his showing them some favors. 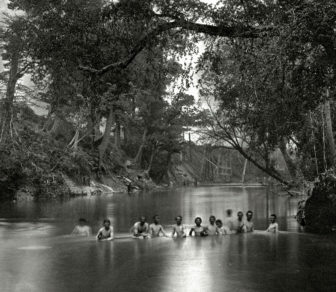 Occasionally through the summer he allowed the prisoners several hundred at a time to go to the river to bathe, under guard and an implied parole not to escape. The prisoners never, to the writers knowledge, abused his confidence. He would listen to complaints, and, if well founded, would remedy the evil. At one time the militiaor, more properly, the recruits in an adjoining camp of instruction made a practice of firing their muskets, loaded with ball, in such a direction that the balls fell in the prison enclosure. The whizzing of lead became a sound of daily occurrence, but the prisoners stood it very patiently till one of their number was struck and seriously wounded. A committee was then sent to Col Fundy, to remonstrate and to plainly intimate that if the nuisance was not abated, the prisoners would themselves go out and stop it. He gave them patient audience, and promised them there should be no more trouble. About the middle of July he attempted an exercise of authority that cost him much of his popularity. For some time it had been customary to make details of the prisoners to do work outside the camp, they not being averse, as it gave them a slight relief from the monotony of prison life. On the 14th of July a detail was made as usual, but when they found that the duty was to bring in a Federal flagstaff and assist in raising it, they promptly refused to work. An attempt was made at coercion, but Col. Fundy, seeing that they would rather be shot down than obey, sent them back to quarters. Finding that none of the prisoners would volunteer, as a punishment, he cut down their rations, which, prior to this time, had been according to army regulations. Nothing more was done in regard to the flagstaff for a week, when a detail of Federal soldiers brought in the spar, and on the 29th attempted to raise it in front of headquarters a large crowd of prisoners watching the operation, and greeting with a yell each failure. Finally, the blue-coats accomplished the feat, and, their hands relieved, they gave vent to their wrath by hurling a volley of sticks and brickbats at the jeering rebs. The latter were not slow to send the missiles flying back, and the Federals, finding that in this game they were getting worsted, started for their muskets. Of course the Confederates at once dispersed, but a battery of artillery was brought out, so as to rake the street, and the guards were in a state of chronic scare for a day or two. The feeling between the prisoners and guards was not very friendly, and the former delighted in keeping the latter in fear of an outbreak. When there was a prospect of stormy weather, the prisoners in the tents would listen for the tramp of the sentinel, and when he approached within earshot, they would discuss the question of an outbreak, intimating that there was a plot to escape on the first stormy night. On several occasions the ruse succeeded so well that the garrison was kept under arms in the rain nearly all night. Practical jokes were common among the prisoners, and served to relieve the monotony of their durance. A jovial Irishman in Co. E, on one occasion, went to the quarters of Co. K, and informed a number of his acquaintances that his mess had a pot of soup that they did not want, and invited them to bring their cups down and get some. The guests, with tin cups and spoons in hand, followed their host to his tent, to find that the soup-kettle had been accidentally upset and its contents spread over the ground. Watching their opportunity, the disappointed soup-eaters invited their joking Irish friend, as he passed by, to sit down to a plate of fritters. He accepted, only to get a mouthful of cotton covered with batter and browned in the frying-pan. Sometimes the jokes were of a rougher character, as when a member of Co. C, who had eaten a very hearty dinner, was given a drink of sherry, wine of ipecac, surreptitiously obtained from the hospital. Of books and other reading-matter there was a dearth, and, as at other prisons, the men resorted to trinket making as a pastime. Rings, breast-pins, crosses and similar articles were turned off in great quantities, every barrack and every tent being a manufactory. Bone, vulcanized rubber, cocoanut-shell, mussel-shells, gold and silver were the materials; old case-knives made into saws, files, camp-made bow-drills, pocket-knives and sand paper the tools. From the rations of beef was obtained the bone; mussel-shells were gathered in Sangamon River by the water-details, the scanty pocket-money furnished the gold and silver, while the files, sand-paper and rubber in the form of buttons and rulers were procured by trading rations with the commissary, The delicately- shaded pink and white shells answered admirably for mother-of-pearl for inlaying. No little taste and ingenuity were displayed in the making of these articles. The reception of the mail was an occasion of daily excitement, and the postmaster was surrounded by an eager crowd while the names of the lucky few were called. Correspondence was limited to one page to a letter, but the number of letters was limited only by the prisoners ability to pay postage. But few letters came through from the South, and the bulk of the mail was for the Tennessee troops and those having friends in the North. On June 28th a letter dated Camp Douglas, Chicago, was received by Eli Sears from J. Hearndon, giving us the first intelligence of those of the company who were left at Island 10, sick. As previously mentioned, the senine in number were sent to Madison, Wis., where J. F. Smith died, May 15th, and C. J. Moncrief on June 6th. Subsequently, we learned that E. F. Brown died September 4th, at Camp Douglas, to which camp they were transferred in June. The treatment of the prisoners at these two camps was very different from that at Camp Butler. No privileges were allowed; the rations were insufficient to satisfy the cravings of hunger, and as they were served to the prisoners cooked, there was not the variety which tends to keep men in health. About the middle of August the prisoners were enlivened by the hope of exchange, and on the 1st of September the work of making out the exchange-rolls began. On September 2nd, those who took the oath of allegiance mostly from Tennessee left for their homes. 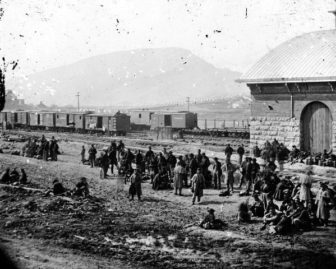 On the 6th, one-half of those to be exchanged took the cars for Alton, there to embark for Vicksburg; and on the following day the remainder started, excepting a few sick. The First Alabama prisoners were among the second detachment. Many of the cars were open platforms, and the trip in the hot sun to Alton was quite trying to those who had been so long imprisoned. At Alton the prisoners were transferred to transports, which left on the 8th and arrived at Cairo on the 9th. There the remainder of the Fort Donelson and Island 10 prisoners joined us, and, on Thursday, September nth, the fleet steamed down the river. Several gunboats accompanied the fleet, which proceeded only during the day, anchoring or tying up to the bank at night. On the 12th, the fleet passed Island No. 10, whose deserted earthworks were fast caving into the river. At Memphis the fleet remained two nights and a day. While there Jerry Stuart, of Co. C, First Alabama, died and was buried. There were some twenty-one or twenty-two deaths among the prisoners while on the way down the river; and nearly every night or morning there was one or more rude graves dug on the bank wherever the fleet was lying, and the un-coffined dead left behind. On the 18th we passed a fleet of transports returning from Vicksburg with Federal prisoners. Sunday morning, September 21st, the fleet anchored above Vicksburg, at the appointed place of exchange; and on Monday morning the prisoners were disembarked and marched across the bend to the ferry opposite Vicksburg, where they crossed over. The sick on the hospital boat were transferred to a flag-of-truce boat from Vicksburg. The citizens had prepared a bountiful barbecue, and did everything for the prisoners comfort that their limited means permitted. Lieuts. Hall and Tuttle met Co. K at Vicksburg. Capt. Whitfield going on to Montgomery, Ala., on a brief leave of absence.